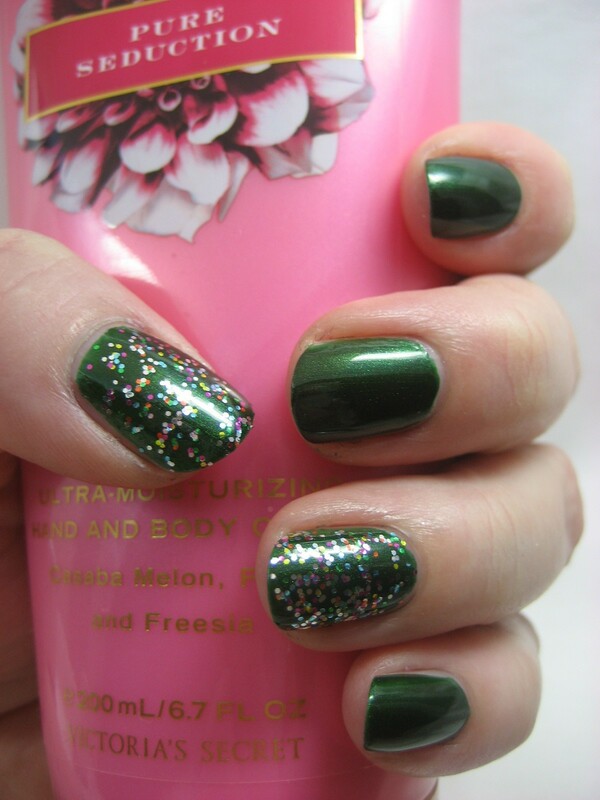 Another seasonally appropriate polish to share today: China Glaze Jolly Holly, from this year's 'Tis the Season collection, to which I added accents of an unnamed Ornaments glitter I got from one of the Christmas displays at Meijer. 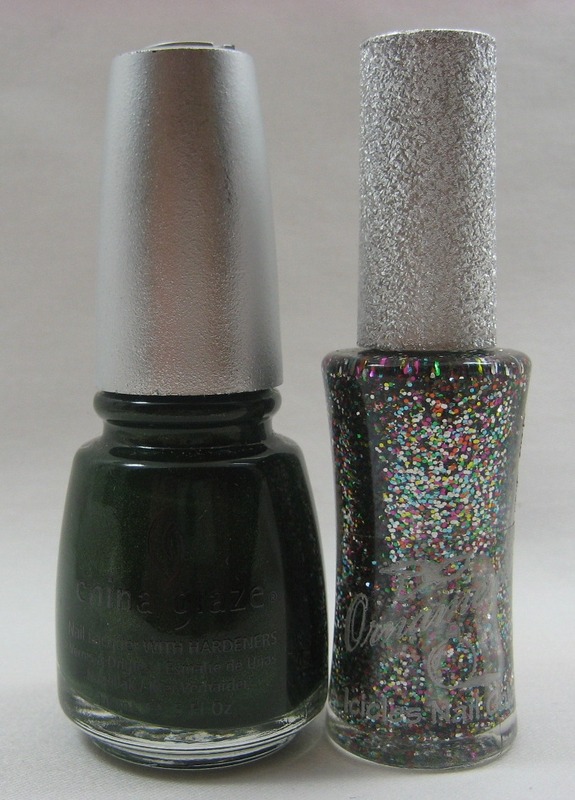 Jolly Holly is a forest green shimmer which I quite liked. It's not too dark and not too yellow-toned for me to pull off. If I had to guess (which I do, because I've lost my notes), I'd say I used two coats. I added the glitter to my ring fingers and thumbs. 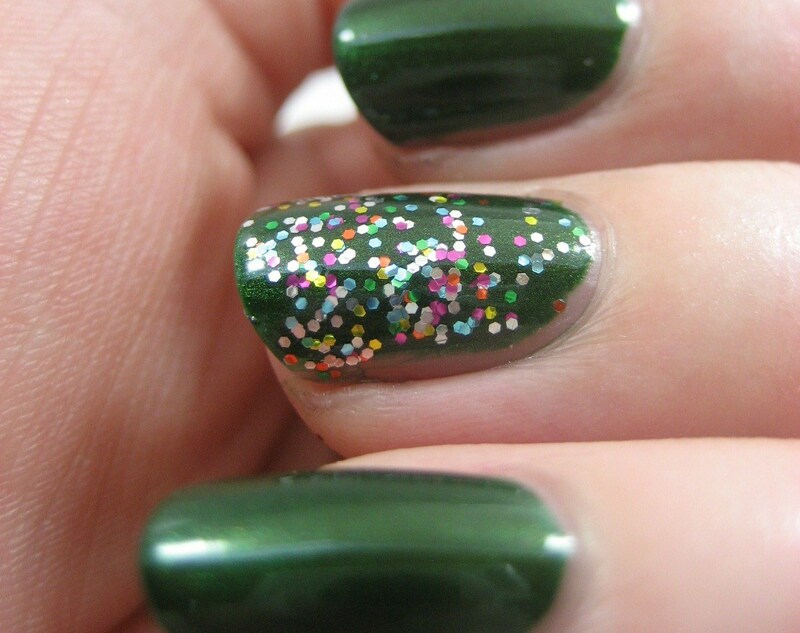 I quite liked the glitter, too; pity it's not in a permanent line. I kept holding my glittery nails up to other colors while I was shopping and thinking things like "ooh, it would look good with that pink". We had the first big snowstorm of the season here in metro Detroit and traffic was astoundingly bad this morning. I'm sort of dreading heading home, but I can't sleep at the office so into the mess I'll have to go at some point. I drew numbers for my holiday giveaway this morning and winners have been notified by e-mail. 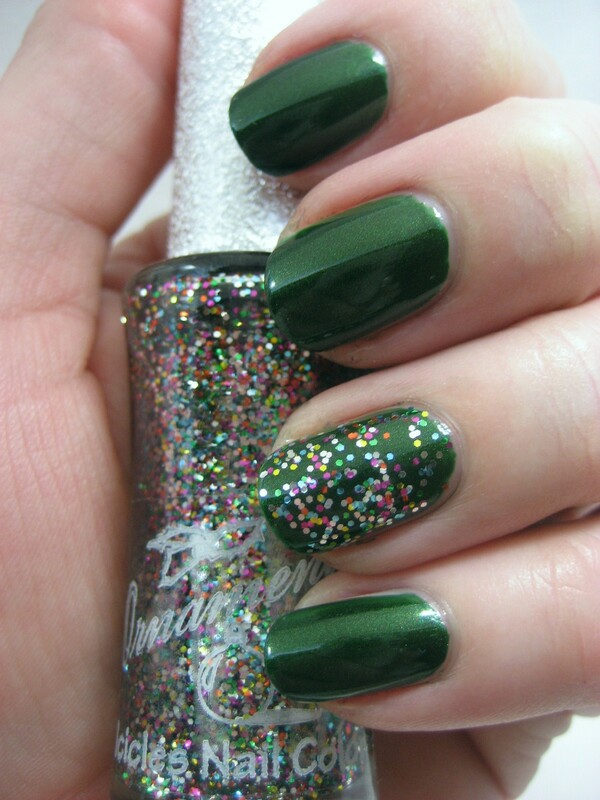 I have this glitter polish too! :) It says "Icicles Glitter Nail" on the side so I just went with that as the name. :( Meh I was driving around today and it was horrible! I love love love Holly Jolly! I might actually have to get Jolly Holly... But I meant to say, I hope you get home alright! OOOh I like that glitter polish!! Where did you get it? We didnt get the snow we ended up with freezing cold rain in Boston. Yay for Jolly Holly! I like that glitter too...bottle's cute as well! Breathtaking! I'm a sucker for greens. Love the glitter! Thanks so much for sharing. I love that glitter polish! Then again, I love everything glitter! I would never have thought that combination would look good, but it does! Very pretty. I love that glitter. i wish we had Meijer here! I really like Jolly Holly too!! Looks good on you Karen! Horrible snow!! I mean, I love looking at it, but when you have to go out of the house and drive, it´s a disaster. We´ve already had a lot of snow too since november, which is not normal for the Netherlands. Global warming?? I don´t get it, it´s only getting colder here. And congratulations to all the winners of the giveaway! Have to admit that I´m a little jealous, hahaha. It really was a great giveaway. Miranda, global warming doesn't mean we'll all get tropical conditions all the time. :) Good thing, too, since I like to ski!